The Chakra Votive Gift Set includes a 20-hour votive size version of each of the seven chakra blends and a votive candle holder. Everything comes in a beautiful gift box along with a guided meditation and information about the chakras. 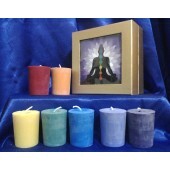 The chakra votives are made with soy wax and essential oil blends, but unlike their jar counterparts, they are not intended to be used as a skin moisturizer.